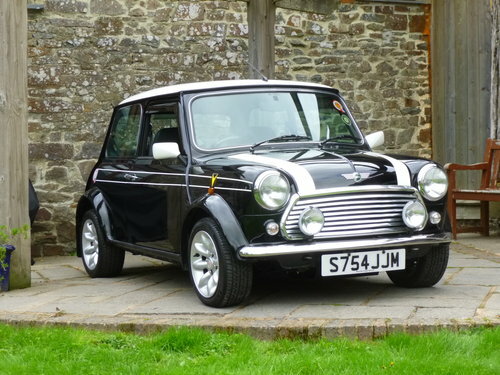 1998 Rover Mini Cooper Sports LE in Black with a white roof. 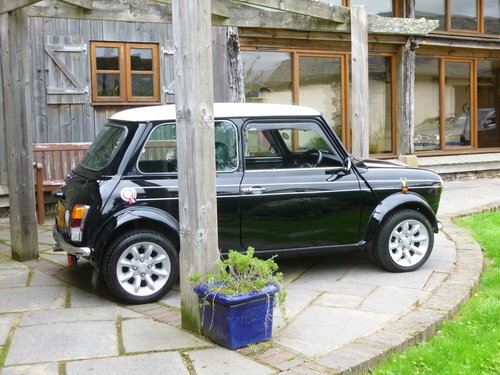 This very special edition was based on the Sports Pack Cooper. 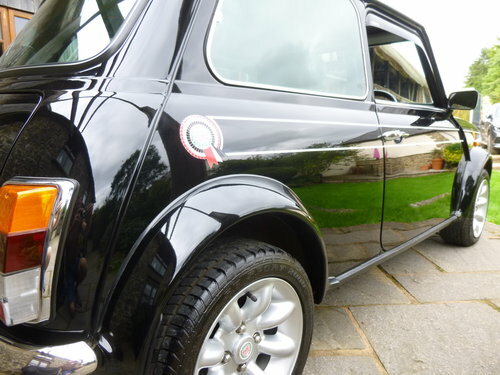 The Sports LE featured a British Vita Racing Style side decal with a BMC style rosette and Mini Cooper logo on the boot. They were built to commemorate the 30th anniversary of the Cooper victory in the four saloon car championship races on 1968. 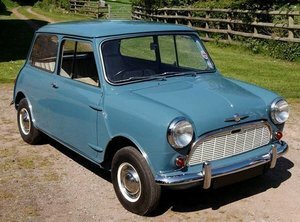 Only 100 were made 50 in Brooklands green and 50 in black making this one of the most collectable and rarest Mini Coopers. This example is in time warp condition and has covered just 32000 miles from new. 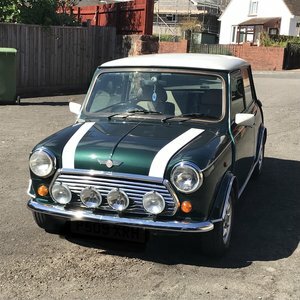 After selling over 650 minis if I was asked to guess the mileage after fully inspecting the car I would say that it had covered under 10,000 miles. 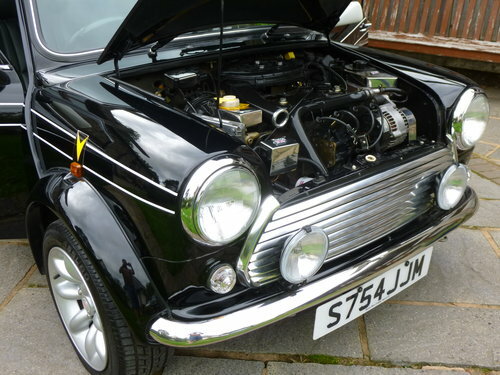 The secret to the condition is that it has always been a second car and has been owned by mini enthusiasts from new. It has mainly been garaged and driven in the dry which is why the underside condition is so clean. It was waxoiled underneath from new. To my eye it has never had any paint as all of the paint looks original. 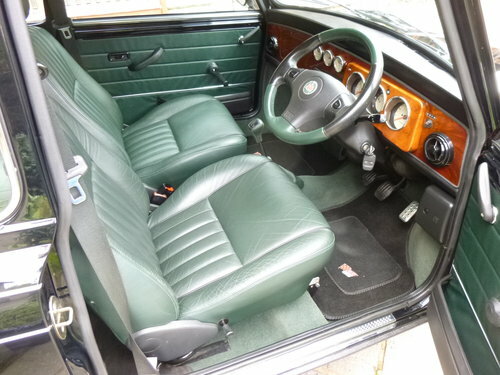 The interior condition is also very clean and very well cared for. 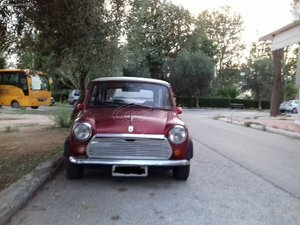 Due to its sheltered life it drives very well and feels positive in the corners and accelerates strongly through the gears. It is factory original with the only changes being a new radio with upgraded speakers, a new exhaust rear section and adjustable height suspension. It has a nice history file from new including all of the original hand over paperwork and order forms plus both sets of keys and a soft tailor made car cover with stripes to match! 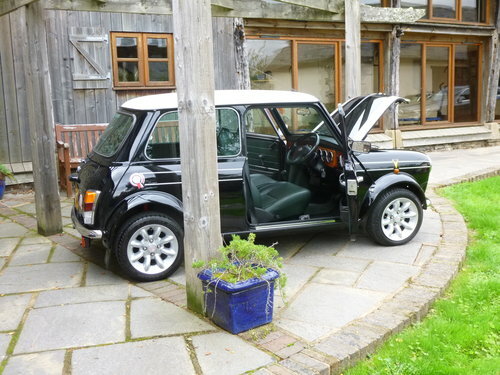 This is a very rare model and the condition throughout will make it an enjoyable and exciting car to own. Free delivery to your door in my curtain sided van within 200 miles of Tiverton. 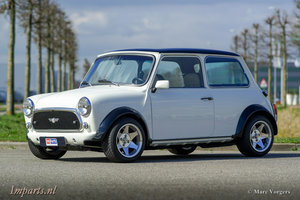 Please click on the finance link on my website to see ways of dividing the payment for your new Mini Cooper Sports LE.